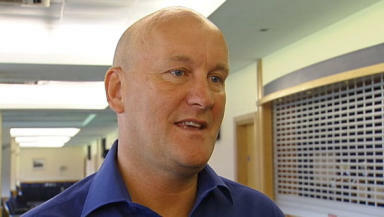 Jim Duffy returns to his old club Hibernian in the second round of the Co-operative Insurance Cup. Jim Duffy is hoping his Brechin side can spring a shock when they visit Easter Road for their Co-operative Insurance Cup second round match against Hibernian. Duffy led first division side Dundee to the final in 1995 before losing to Aberdeen and is now hoping to defy the odds again and put out the Edinburgh side who he managed for three years. Asked by STV if returning to his former club gave the match added spice, Duffy replied: “Of course it does but I’ve had a few old clubs Gerry so you get used to that. But from a club like Brechin the financial impact is very, very important. Brechin booked their second round place with a 4-0 demolition of Elgin on Saturday, while Hibs stuttered to a shock 4-3 home loss by Morton at the same stage last season. However Duffy insists the financial boost the club will receive from the tie against the SPL side is just as important as what happens on the pitch. The tie will be played in the week commencing August 24.